Bay Area Crisis Nursery | Shannon B. Jones Law Group, Inc. 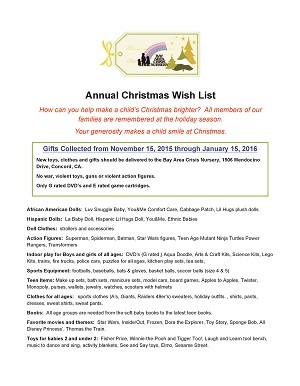 The Shannon B. Jones Law Group is currently collecting food and toys for the Bay Area Crisis Nursery. Barrels are located at their office located at 208 W. El Pintado, Danville, California. All contributions are welcome.